My client emailed me that her 'new garden' was in bloom, and looking great. Finally made it out today, under cloudy skies, to find the elegant Dyckia and the 'Santa Rita' Opuntia still in bloom in the front, while the Palo Verde 'Desert Museum' and other native plant material were also in bloom on the second mound and pathway area towards the front door. This area is on the 2nd mound closer to the front door path, and as you can see it is filling in beautifully. 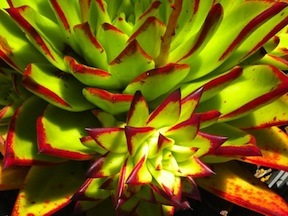 By the time fall arrives, the Echeveria agavoides 'Lipstick' will have nearly doubled in size and have bloomed at least once.